Define your reports…then automate them. Once a saved report or query is defined, use scheduling capabilities to run it automatically on a defined schedule. 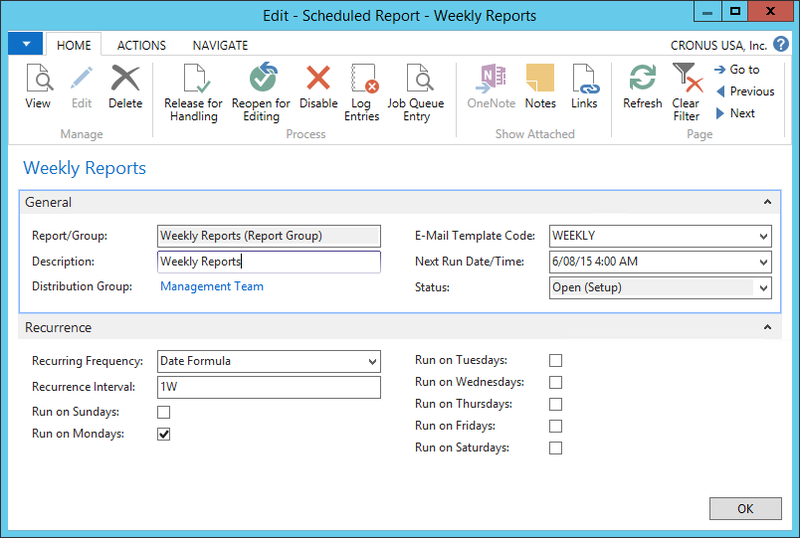 Use the same functionality to schedule entire groups of reports. Want your weekly financial reporting package emailed out to the management team each Monday at 4am ahead of the management meeting? Simply define a recurring scheduled task and it’s done. Using the “Write to Folder” destination that can be defined on a distribution group, set up automated exports for report data that can then be used by employees outside of NAV. The functionality also supports processing-only reports, so tasks like Adjust Cost can be scheduled to run each night. ReportPath provides simple setups for what would normally be complex tasks.